Located in the center-west of the Province of Neuquén, only fifteen kilometers from the border with Chile, this wild spot which surrounds Villa Pehuenia makes contrast with the quietness of its setting with its impetuous geography. Shielded by stunning mountain ranges, on the northern bank of Lake Aluminé, the profuse forests of millenary monkey-puzzle trees (pehuenes) explain its name. The pehuén (araucaria araucana), which grows in these lands since prehistoric times, not only dominates the scenery but also takes root of the history and culture of the mapuche people. Considered as a sacred tree, its majestic bearing offered protection from Andean winds, and its seed, the pine kernel, was the main source of food. Villa Pehuenia gradually grew under its generous shade. Founded in 1989 by the provincial state as a plan strategy of the area, inhabited by five hundred scattered permanent settlers. As an emerging tourist destination, it discovers untouched nature that offers landscapes such as the Ciprés viewpoint, Piedra Negra, the Del Morro viewpoint or the Garganta del Puma. 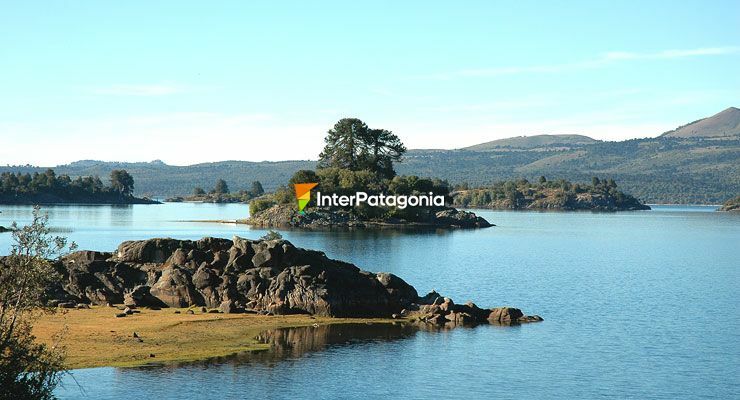 Scenery for adventure, lakes Aluminé, Moquehue, Ñorquinco and Pulmarí offer kayak excursions and sport fishing, as well as horseriding, climbing, hunting excursions, hiking along paths that get in the hearts of forests and mountains. In the winter, the snowy park of the Batea Mahuida Mount, within the territories of the mapuche Puel group, is an invitation to enjoy alpine ski and snowmobile rides, apart from exposing the cultural richness of the community, expressed mainly in their handcrafts and typical dishes. The weather is humid, template and fresh, with temperatures that range between 20 and 30ºC in the summertime, descending to 5 to 0ºC at night. During the winter season, temperatures below zero whiten the scenery, covering the whole area with snow. To reach Villa Pehuenia, located 1,608 kilometers from Buenos Aires, take National Routes 5, 35, 153, 143, then Provincial Route 20 in La Pampa and then National Routes 151, 22, 40 and Provincial Route 13. It can also be reached by plane, landing on the airports located in the city of Neuquén or in Zapala and San Martín de los Andes. From the capital city of Neuquén, located 300 kilometers from Villa Pehuenia, access is managed through National Routes 22 and 40 and along Provincial Route 13. In the winter season, it is advisable to take Provincial Routes 46, 23 y 13 after route 40, making the distance a little bit longer: 386 kilometers. Combining peace and adventure, Villa Pehuenia has an increasing and varied service infrastructure to visit and rejoice in a privileged natural environment, plenty of Andean charm and beauty.